ITALIE - Piazza Armerina - The world-famous imperial Roman Villa del Casale at the Piazza Armerina archeological area in Sicily has been returned to its full splendour following a six-year restoration costing 18 million euros. The villa's mosaics, dating to the 4th century AD, are considered "the finest in situ in the Roman world" according to the UN cultural heritage organisation UNESCO, which put the site on its World Heritage List in 1997. 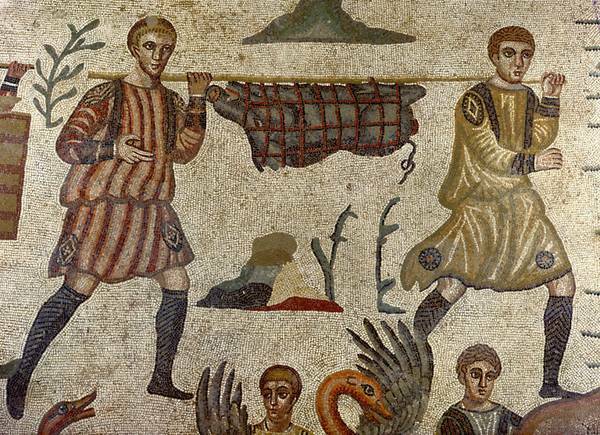 Over 4,100 square metres of mosaic have been cleaned in the restoration and now show their original colours. The old plexiglass roof has also been replaced with a new wooden structure that allows air to reach the remains. The official reopening is scheduled for July 4 and visitors will also be able to admire the villa at night thanks to a new lighting system. Villa del Casale has remained partly open to the public during the restoration. 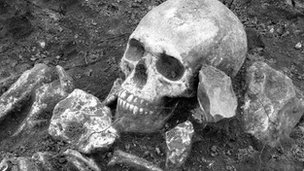 ROYAUME UNI – Great Ellingham - Archaeologists have discovered 85 Roman graves in what has been hailed as the largest and best preserved cemetery of that period found in Norfolk. The site at Great Ellingham, near Attleborough, has been excavated over the last four months and the findings have now been revealed. Among the skeletons, which have been exhumed for further study, there were some which were beheaded after death. The cemetery is thought to date from the 3rd/4th Century. Complete burials and isolated finds of human bones have been recorded at, and immediately adjacent to, the site since the late 1950s. An archaeological evaluation by trial trenching in November 2011 by Chris Birks Archaeology revealed Roman burials and isolated finds of human bone, confirming the cemetery extended into the proposed development site. He said one particular feature that had been identified from the excavations is the seemingly deliberate placement of flints around the skull. 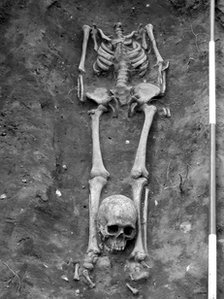 One burial represents a decapitation burial where the head has been placed by the feet, which Mr Birks said was "surprisingly not an unknown type of burial from other Roman cemeteries". "Analysis and research by a human bones specialist will no doubt shed more light on these and the other burials," said Mr Birks. The only grave goods found at the site was an iron finger ring. "The population represented by this cemetery was most probably a rural settlement reliant on farming practices though, at present, we don't know where this settlement was," said Mr Birks. ROYAUME UNI – Chedworth - Archaeologists have begun to excavate a mosaic beneath a corridor at Chedworth Roman Villa in Gloucestershire. At 35m (115ft) long, it is considered to be one of the longest in-situ corridor mosaics in the country. Visitors to the villa near Cirencester are able to watch archaeologists at work from suspended walkways which have been installed overlooking the mosaics. 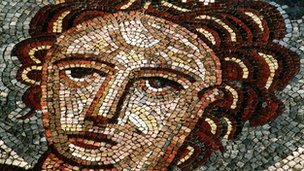 Victorian archaeologists uncovered and then reburied the mosaics about 150 years ago. Mr Papworth said his team were keen to see what lies beneath the soil. He said: "We've lifted the old tarmac path that used to run along here when it was all outdoors and we're gradually working back through the 150 different layers worth of soil and we're excited by the bottom of it where we'll find this pattern mosaic." ROYAUME UNI – Hull - Builders at a college in East Yorkshire have stopped work after finding objects dating back to the Iron Age. The workers constructing a sports court at Wilberforce College, Hull, have made way for experts from Humber Field Archaeology to inspect the site. Digs at the site in the east of the city date back to the 1960s and there was archaeological work there in 2010. David Cooper, vice-principal at the college, said: "This is a really important site." It is thought the objects found are shards of Iron Age pottery. Mr Cooper, who also teaches archaeology at the college, said: "The last dig significantly advanced our understanding of the Iron Age in Hull and East Yorkshire." Mr Cooper also said that the site used to be a school in the 1960s and a teacher had spotted circular marks in the school's field and recognised it as a potential archaeological site. The field remained unscathed during floods in 2007. Mr Cooper said: "Iron Age farmers knew exactly where to stick their farm, this is a well drained site. GRECE - Argos Orestiko - Bilan des fouilles en cours.